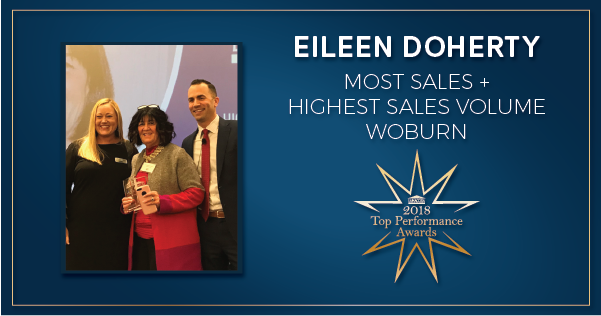 January 17th, 2019 – Lamacchia Realty is proud to announce Eileen Doherty as the winner for Most Sales and Highest Sales Volume in Woburn. She had 43 sales and $22,77,500 in sales volume in 2018. With her expert knowledge of Woburn and the surrounding towns, it is no wonder that she has been a top agent in Woburn for over twenty-five years! Eileen is a member of the Lamacchia Realty 2017 President’s Club and the 2018 President’s Club. Eileen was also recognized in the company’s Top 5 Producing Agents for 2018. “Eileen is a machine. Literally. She never stops. In addition, she has more real estate knowledge than most people I have ever met in this business. I am very happy to work with her and look forward to watching her continue to grow her business in the years to come,” said Anthony Lamacchia Broker/Owner. Eileen joined the company along with several other Realtors from another company in 2016 and she hasn’t stopped since. She is constantly a top agent in the company’s Woburn office. Eileen and all the other Realtors in the companies Woburn office will soon be moving to its new permanent Four Corners location. They have currently been working on Cedar Street since 2016. Click here to learn more about Eileen Doherty.